Do you hunger to experience the level of financial and material provision that God describes in the Bible? Would you love to be financially free, so that you never again have to suffer financially from the whims of people, the economy, or other factors out of your control? So would I. And I believe I’ve found a Biblical secret–a nugget of wisdom–that we can all begin to implement today that will help us eventually reach that place. The secret is in Ecclesiastes chapter 11, and I believe it’s a key to financial prosperity. It has to do with developing multiple sources of income. In the morning sow your seed, and in the evening do not withhold your hand; for you do not know which will prosper, either this or that, or whether both alike will be good” (Ecclesiastes 11:1-6, emphasis mine). What does this passage tell us about personal finance and developing multiple sources of income? 1. 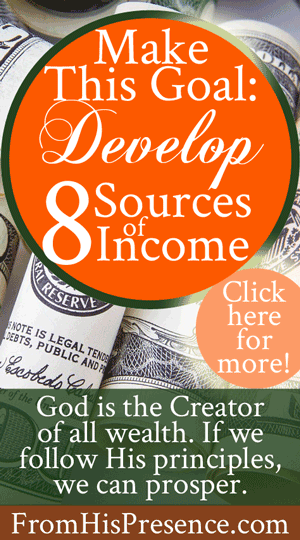 Every family needs to develop 8 different sources of income. 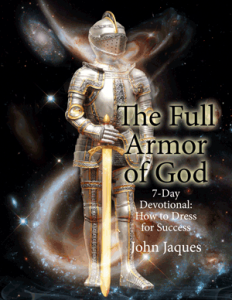 God says in Ecclesiastes 11:2 that we should “Give a serving to seven, and also to eight.” This phrase can also be translated “Divide a portion to seven,” “Make a portion to seven,” “Commit a portion to seven,” etc. This verse, and the verse before it, are referring to investing your sustenance into moving, flowing places in order to bring you a return when you need it. If you read further down the text–in Ecclesiastes 11:6, we can see clearly that this passage is about handling things that bring us harvest, income, and increase. You could apply this principle to a lot of places. It’s commonly taught by Christian financial advisors when they’re talking about diversification of someone’s investments. However, I’m convinced it applies to income too. God says diversification is good; and that when we diversify, we should diversify to 8. This includes our investments AND our income sources. Can you imagine the level of freedom you would have with 8 sources of income? Moved out of your house awhile back; and, instead of selling the house, you hired a property management company to rent it out for you at a profit (source #8). Do freelance editing or proofreading work. Sell items on Amazon or eBay. Help other people with interior design. If all of those sources of income brought you money every month, wouldn’t you feel a lot more stable than you would feel with just a traditional job? Think about it: if you had 8 sources of income, and you lost your job, you wouldn’t panic. You might be concerned, but I think you’d actually have more drive and motivation than ever before. You’d just pick one of your other 7 sources of income, and you’d get to work on that one. Each source of income wouldn’t even have to be huge. However, all of them combined can add up to a nice income–an income that is STABLE; an income which you create–not an income that leaves you at the mercies of other people’s whims. 2. You can’t let what could happen get in your way when you start diversifying your income. In the passage above, Ecclesiastes 11:4 says, “He who observes the wind will not sow, and he who regards the clouds will not reap.” Beloveds, there will always be negative possibilities. There will always be risks. There will even usually be naysayers and even haters who want you to be miserable just like they are. But look at the positive possibilities! Look at the rewards! Look at the fulfillment! And look at the PROVEN success that entrepreneurs all over the world, since the beginning of time, have experienced! Make your plan and write some goals. Write the vision! Get started with just one of your income sources. Work on just one for awhile, and the other sources will follow in due course as you work. Plan for a safety net if your business involves risk. Hint: Sometimes this is easier if your family and/or friends actually don’t know what you’re doing at first. There’s tremendous power in maintaining holy silence at the right times, instead of letting people always know what you’re doing. Check out this post for more about that. 3. Things will occasionally happen, and sometimes you’ll have failures. Don’t sweat it; just try something else. I’ve failed a bunch of times. I’ve failed at selling makeup (I gave everything away and never made any money), portrait photography, gardening, and more. It doesn’t mean that those aren’t perfectly legitimate businesses. It just means they didn’t work for me. What’s right for you may not be right for someone else–but you may be a rock star at it. Doesn’t matter. Just find what you’re good at–what you love–and work on that. And keep doing that until you have 8 different sources of income coming in. Beloved, you and I can be financially free. I believe it’s time to start working on our freedom plans daily. Think of several different sources of income you’d like to develop. Write down some specific goals and tasks, and get started on one today. Then keep it up, in tiny increments, day in and day out. I believe you won’t recognize where you are in even a year; you’ll have come so far. Does this word resonate with you? If so, please leave a comment below! I’d love to hear from you! Wow! Thank you Jamie, this word is timely. it’s a direct answer to prayers I literally prayed minutes before I read your blog post. It’s a direct confirmation that I should proceed with the business ideas I’ve been processing this week and not to be afraid of the what ifs. Thank you for allowing God to use you to be a blessing. That is so super-cool!!!! You can do it! And more importantly, God in you can do it!! I think this is a great post. And I like the holy silence idea. There are some people you just can’t talk to about anything. Hi Jamie, hope you’re doing fine. The post you’ve sent me is translated as requested. I just have to go through it again to see if everything is ok. Sounds great, Rafael! Could you email it to me in a PC-compatible Word document? I’ll do it in the next few days. i liked how you said “im preaching good now” it felt good to read that and imagine you saying it. Meaning no disrespect, Jamie, but I prefer to take to heart the words Jesus spoke in Matthew 6:25-34. Solomon had much wealth, wisdom … and women, but towards the end of his life he allowed riches, women, and pagans to lead him astray. Jesus, on the other hand, told us that when we make God our sole focus, He is abundantly able, and willing, to provide all those things that we really need. As an overseas missions worker I found this to be absolutely true – even when the Indian government told us to leave suddenly, leaving all our worldly possessions behind! God has never, and will never, let me down, and I have learnt to see whatever happens through His eyes. When my nursing agency dismissed me because I refused to work on my own overnight administering drugs that, by law, require two people to check them, I realized that was God telling me, “You’ve done enough night duty. Your health is now a greater priority than any money you have been earning. I will provide.” And He has done so amazingly – in ways I could never have anticipated! And I’m certainly not saying we should sit there idly, waiting for things to fall into our laps! When we keep our focus on God, it’s amazing how He opens doors, and gives us creative ideas in line with His purposes. Jamie, this is a very timely word for me. I’ve struggled with do I do this or that when my main job should all my attention however thats just crazy when diversifying is key to financial increase. I felt like I waa given a release and a blessing to go create other ways income. Why do we put ourselves in a box or a rut? And oh, the pointing of fingers toward me. Thanks Jamie! And oh btw, you are preaching some good stuff! Angela, you are such a creative person and I believe if the Lord is giving you ideas, there’s every reason in the world to steward them well and go after what He’s put in your heart! Jesus told us to “occupy” until He comes; and that word “occupy” means “do business!” in the Greek. So go for it sister–do business! It’s Father’s will for us to be ever-so-blessed and prosperous, and never to have to depend on the world’s systems. Thank you for sharing the Greek to “do business” I just love that! Sometimes we forget that we are to “do business” and that its ok to “do busines” until He comes! Wow! So simple and yet profound. Thanks so much for the nudge and reminder. I needed to hear this! Keep on sharing and teaching with us! I have learned so much fron you! Blessings to you! This is great! As I have gotten involved with the “real food” /local food community I was introduced to the idea of multiple streams of income. My husband and I each have regular day jobs. I also teach a 2 to 4 classes each semester at a local university and have a growing doterra essential oil business that has really helped us tremendously. I feel the Lord wants me to write. I have a blog name in my heart, actually 2 blogs ideas. And a book I think I get to write with Him. A year ago God spoke about a baby and I found myself pregnant. Shortly after He dropped the perfect job in my lap, a legit work from home salary job that is incredibly flexible and allows me to teach at the university. I am confident He wants me to do all of these things..mommy, job, the teaching, and writing, and doterra. But I’m really struggling juggling it all but I know He will help me. I really think He wants to make my doterra biz bigger to bless our family and help us be debt free but I also think He wants to use it as a ministry. ..my dream is to be more bold and offer prayers for healing as I teach classes on the oils and do events. He is growing me in the prophetic and He has given me a heart (and I think a message) for the “new age” community that you often encounter in realms of natural health. I’m really struggling with fitting this in and writing so I question if the Lord really wants me doing all this or am I off on the timing? This was very encouraging to me. Even though i feel i hear God’s voice clearly on this I’m struggling being obedient here. I’m working on pressing in to diligence to conquer my procrastination but it is such a process subtracting things to make room for His best for me. 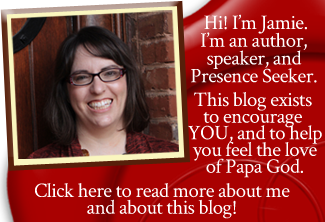 Jamie, Thank you for sharing this blog. I am not normally a blog reader but yours first caught my attention when a friend of mine shAred your President Elect Dream . . I have now downloaded the bookmark and will have a more strategic prayer focus for our president elect Donald Trump. This particular blog I went on to read has given more yet one more confirmation from the lord I know that I am to persue training to earn my license in real estate. I am not gonna lie it seems overwhelming in the moment. I believe God will see me through and he will walk with me each step of the way. This will be #5 Source of Income . Thank you again and God Bless !!! Hi Michelle! It’s great to meet you, and welcome to our Presence-seeking community. I’m so glad this post encouraged you. I know the real estate licensing process can be challenging, but if you’re called to it, it will be worth it! You can do it and our Jesus will be your strength. Many blessings to you, and thank you for helping pray for President-elect Trump! I so appreciate your reading! Hi Jamie – this is such a timely word for me. I left my job I in July last year and have started a blog which I am experimenting with., I know I am meant to write but can’t seem to get going on that. Procrastination is a beeg problem of mine. I run a small sideline business that I have run for a few years now. I love your blog and have been inspired by so many of your teachings. May God continue use you in a mighty way.